General Description: ​Ouray Hot Springs​ is a family destination located along the Umcompahgre River in the San Juan National Forest in Ouray County, Colorado. This hot springs resort is referred as the “Switzerland of America" is owned by the city of Ouray. Ouray boasts 5 outdoor hot springs pools including one with a hot springs waterslide. Ouray Hot Springs offers a fitness center and massage service. Location: From Grand Junction, Colorado is 100 miles or about 1 hour and 45 minutes to drive to the hot springs. Accessibility: ​Ouray Hot Springs​ ​​is accessible. You can drive up to the resort. This is a large property. It is an easy walk around the resort. The facility has handicap accessibility. Hot Springs: ​​The Ouray Hot Springs source comes from Box Canyon with a temperate of 150 degree mineral water is then gravity fed over a mile to the current day location of the pool. The flow is 250-300 GPM of hot mineral water. The flow through design allows for fresh, clear, odorless mineral water 24 hours a day. ​The hot springs pools are chlorinated to the Colorado Department of Health Regulations. Ouray boasts 5 hot spring pools that include The Shallow Pool, The Hot Pool, The Lap Pool, Activity Pool and The Overlook Hot Pool. The Shallow Pool is family friendly pool that has a temperature between 92-98 degrees. This pool has a volleyball court net. The Hot Pool has a temperature of 100 - 106 degrees. The Overlook Pool is two pools divided by an infinity edge waterfall. The temperature is between 104 - 106 degrees. 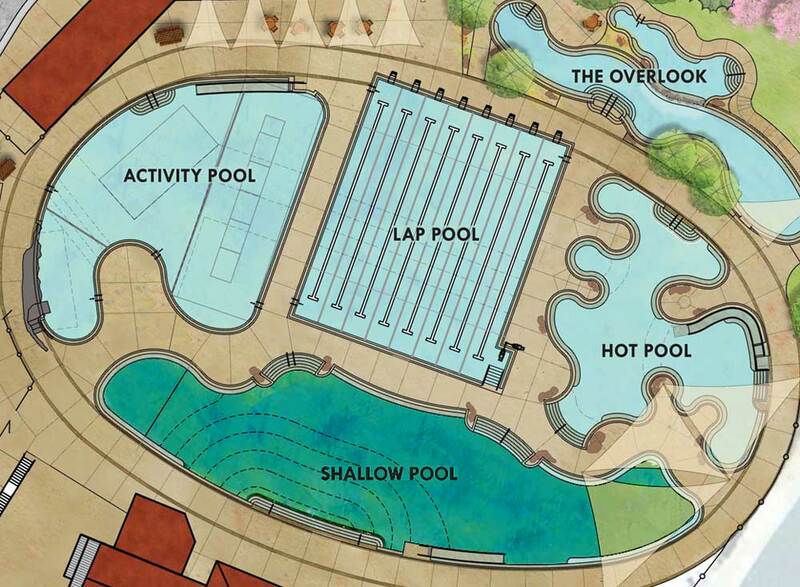 The Lap Pool has 8 full size 25m lanes with ADA access lift and staired entry. The temperature is between 78 - 82 degrees. The Activity Pool features a Wibit inflatable obstacle course and a 12 foot tall climbing wall. The temperature is between 78 - 82 degrees. Clothing is required. Hot Spring Tips: ​​Ouray Hot Springs is open all year round. Soaking is available for day and evening use only. This resort closes every evening. Some of the hot spring pool are seasonal. Check for availability. Ouray does not have accommodations or dinning. No, alcohol of any kind is not allowed in the facility. ​This hot springs has changing rooms, showers, and bathrooms. Ouray is not pet friendly. ​Ouray Hot Springs offers a fitness center and massage service. Youtube Video on Ouray Hot Springs is below.